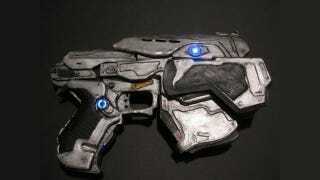 Some time ago we shared the papercraft wonder that was Leo Firebrand's Fallout 3 homage: the laser pistol. Paper (and some papier-mâché for the gun handle) alone yielded a believable piece of the post-apocalypse. Firebrand has taken his gun-smithing to another level with the Snub Pistol used by Gears of War's Marcus Fenix and his fellow comrades-in-arms. At his homepage, Firebrand describes the project as a labor of love and patience, as the inclusion of LEDs presented a distinct challenge. Housing these blue bulbs is, naturally, nothing but paper, paint, and some foam core for internal support. We Will Be Remembered, My Sweet... Just Don&apos;t Ask for What.